This PDF 1.4 document has been generated by Microsoft Word - YLOD fix.doc / doPDF Ver 6.2 Build 289 (Windows XP x32), and has been sent on pdf-archive.com on 27/03/2012 at 09:08, from IP address 184.145.x.x. The current document download page has been viewed 1785 times. File size: 1.3 MB (18 pages). 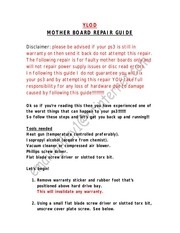 warranty on then send it back do not attempt this repair. will not repair power supply issues or disc read errors. caused by following this guide!!!!!!!!!!! the worst things that can happen to your ps3!!!!!!!! So follow these steps and let’s get you back up and running!!! Heat gun (temperature controlled preferably). Isopropyl alcohol (acquire from chemist). Vacuum cleaner or compressed air blower. Flat blade screw driver or slotted torx bit. positioned above hard drive bay. unscrew cover plate screw. See below. towards the left. See below. wire) and remove tape on side of psu, now lift off psu. 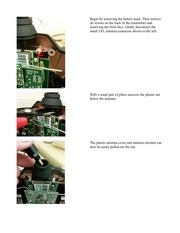 Remove hard drive cover, see below. drive by sliding towards gap in the bay. See below. Remove hard drive, see below. Remove small ribbon (lift tab) and remove control panel. Unscrew 8 screws, see below. Lift enclosure out of plastic base, see below. Now unclip black rear panel and remove. pass through gaps in plate without damage, see below. (Taking note where heat sink rubbers are positioned). fan power connector and fan, see below. connector and unplug battery connector. See above. Now remove plate. See below. of the old heat sink compound has gone. heat sink compound has gone. Typical example of dust build up. See below. bits that looks something like this, see below. surface (kitchen work top or melamine shelf will be fine). After 15 to 20 seconds move onto the next area. (DO NOT MOVE MOTHER BOARD WHILE COOLING). After 10 to 15 seconds move onto the next area. tried it as yet so the choice is yours). when you can almost see through the paste. Now repeat on the other processor. PS3’S (MY NEW PSN FRIENDS). This file has been shared by a user of PDF Archive. Document ID: 00037854.